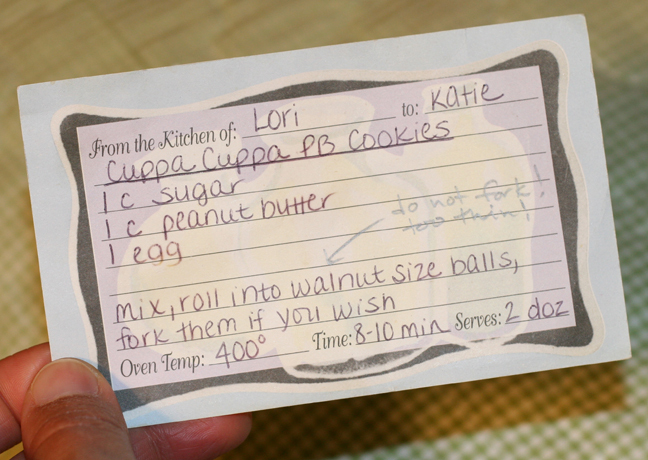 Whenever someone eats these cookies, they inevitably ask for the recipe, and are baffled to hear how easy they are to make, and that an egg can actually hold the peanut butter and sugar together. 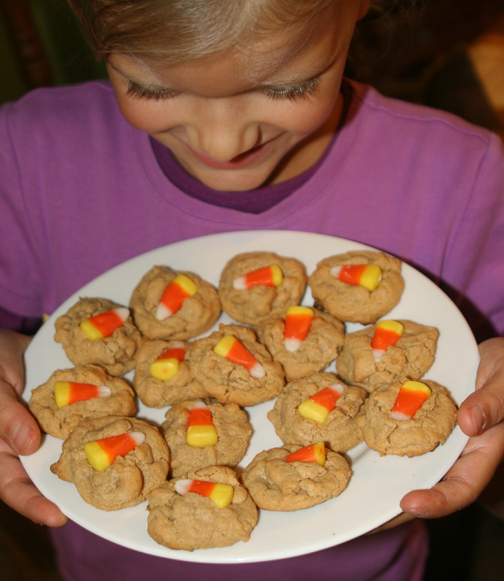 They are always amazed at how moist these cookies are, how well they hold up and just how good they taste! The photos below will give you an idea of how versatile this recipe is…I usually double or triple the recipe, and freeze some afterwards. Yes, they even freeze well! Candy corns and Hershey’s Kisses work well, too! 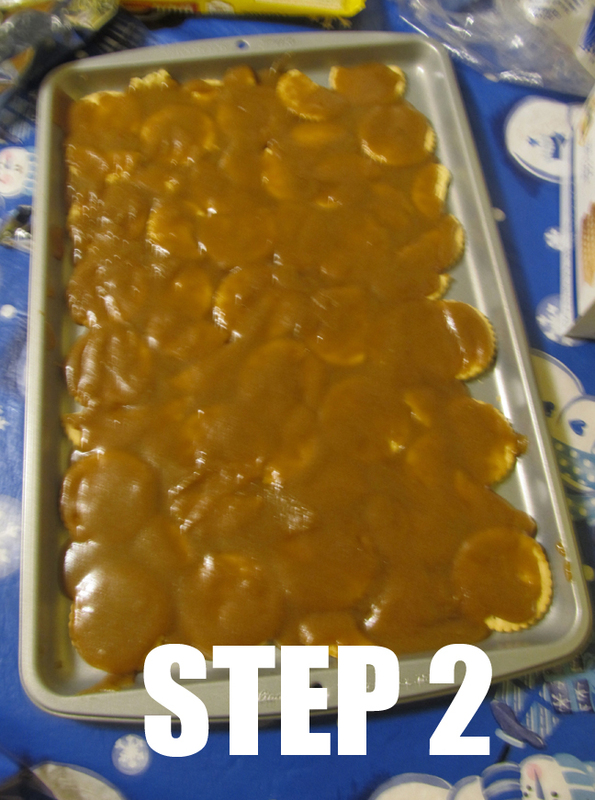 Just press candy on top of the cookies immediately after they have finished baking. 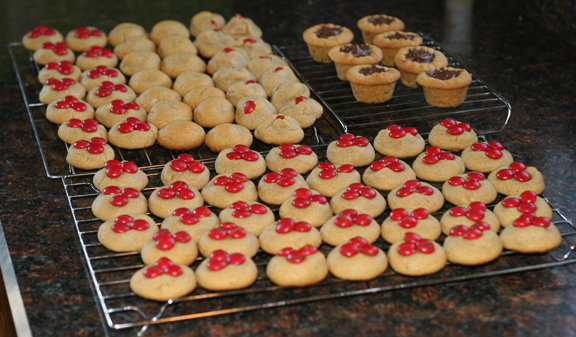 Below you will see the amount of cookies you can make when you triple the recipe. 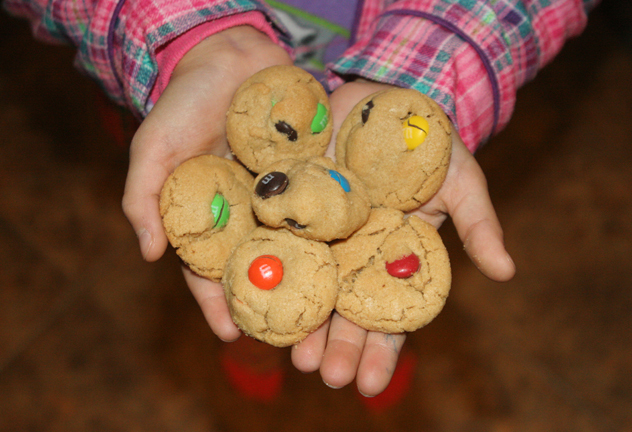 For most of these cookies, I pressed 3 m&m’s onto the tops before they baked. Just make sure you watch them — if they’re in too long the m&m’s might crack. Others I left plain and others had m&m’s mixed in with the dough. Some final tips: (1) Let your kids help! You couldn’t find an easier recipe and the dough is very workable and isn’t sticky at all. (2) As I wrote in pencil on the recipe above, I don’t recommend forking them. Whenever I do this, they turn out too flat. Keeping your dough balls as round and high as possible when you put them on the cookie sheet to bake will give them the best shape. 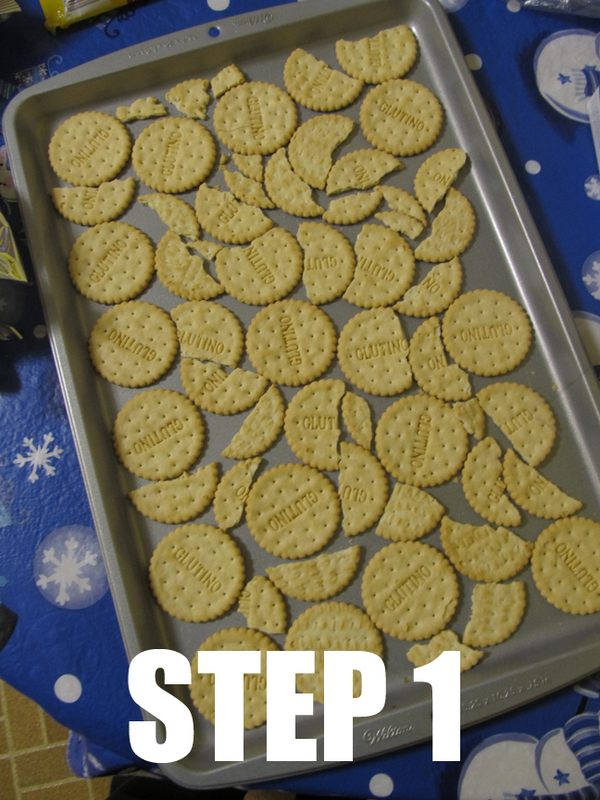 (3) Keep an eye on the bottom of your cookies so they don’t burn (mine are usually done in 7-8 minutes), and (4) let them cool on the cookie sheet before you try to move them. 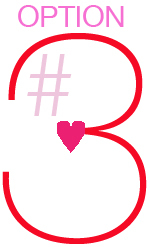 This helps solidify them so they won’t break apart. If you follow these tips, you should have excellent results! 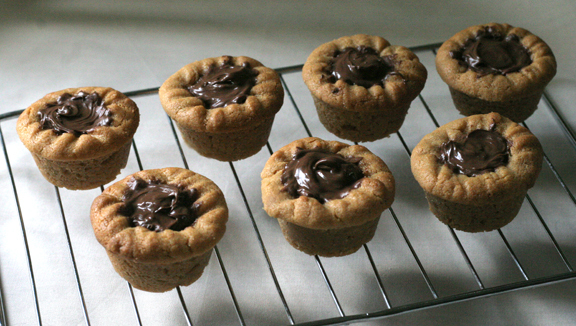 Really — you must try these — even if you just do a single batch. You will be blown away by how good they are… And, if you try any other variations with this recipe, let me know! Happy once, happy twice, happy chicken soup with…pasta? I was sick recently and got the urge to make the first batch of the year. 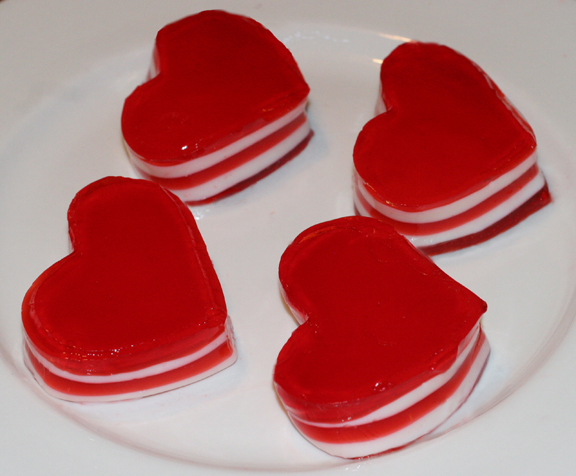 I was also actually feeling very patient that day, so I invited my girls to help me make it. Sometimes I get a response like, “But we’re playing!” but that day I got two bright “Okay!”s. Now that they’re getting older, I let them do more work with recipes, which is probably part of the reason they were so eager to help. In past years they would only get to do a few jobs, but now they’re using sharp knives, operating an electric chopper, stirring things over the stove, and the latest excitement — learning how to use the new handheld can opener! So, like it says in the book, we set out to make chicken soup with rice. However, we were out of rice, which is a rare occurrence. Instead, we used gluten-free pasta, using my sister-in-law’s recipe with a few modifications. The girls proudly wore their two (of many) aprons that my Great Grandma Bertha handmade for herself many years ago. And they brought me mine, too, since I always seem to forget to wear it. I kept a few jobs to myself like cutting the chicken up and dumping everything into the boiling water, but overall they were able to help with almost everything. And we were all in good moods, which definitely helped keep things fun. There have been times we’ve set out to do a recipe where there are arguments between my girls about whose turn it was to dump a tablespoon of something into a recipe, and I was feeling short-tempered and sent them out of the room crying. There have been other times when I was rushed for time and impatient with their attempts to help. Again: not a good combination. There have been memorable, happy times as well, of course. Good, bad and downright ugly — it’s all happened in our kitchen. I have learned that, personally, there are two main prerequisites for making food with my kids: lots of patience and lots of time. If I don’t have both of those, it just doesn’t work for us. Thankfully, this particular soup-making day was one of the good ones, completely without incident. Those happy times are the ones I cherish with my girls, and I know they do, too. 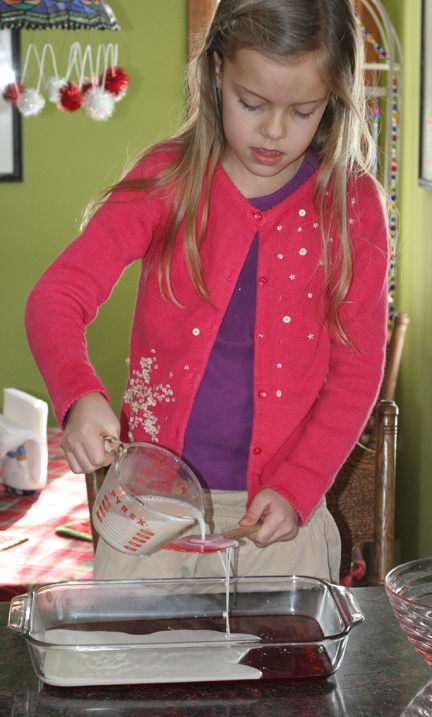 I could list a bunch of reasons why it’s important to get your kids into the kitchen with you, but I won’t. We all know that learning to help with recipes will teach your kids lots of valuable things, like measuring skills, following directions, learning kitchen terminology, how to use different tools, etc. But for me the main reasons I ask my kids to help me with a recipe are: the quality time it gives us and the pride they take in being part of a successful gluten-free food discovery. All of the other things are just icing on the cake. 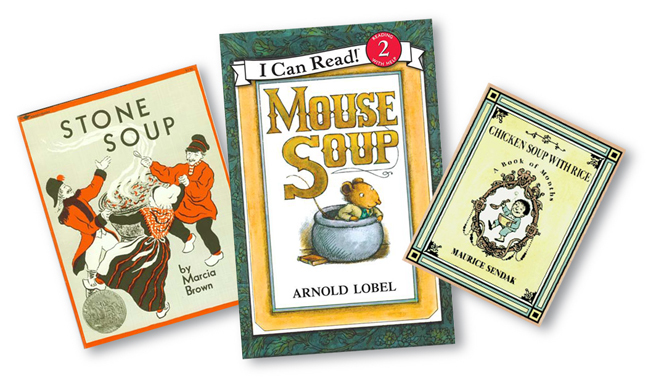 Get your kids in the mood to help make soup by reading these wonderful children’s books together. 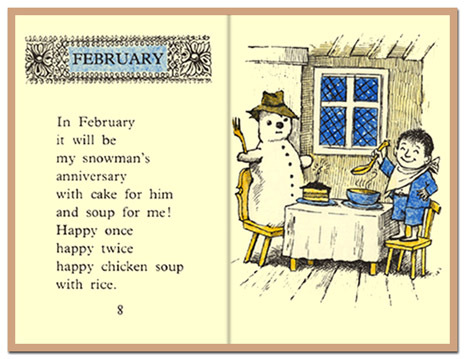 If you don’t have them, here are cute videos of Maurice Sendak’s Chicken Soup With Rice (sung by Carole King) and Marcia Brown’s Stone Soup. 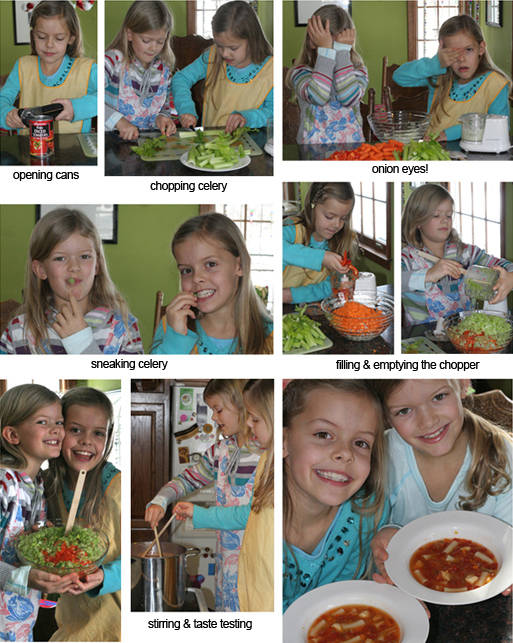 What’s your favorite kind of food to make with your kids? What factors come into play as you decide to let them help or not: time constraints, moods, number of ways they can help, etc.? What are some ways you make kitchen time quality time? 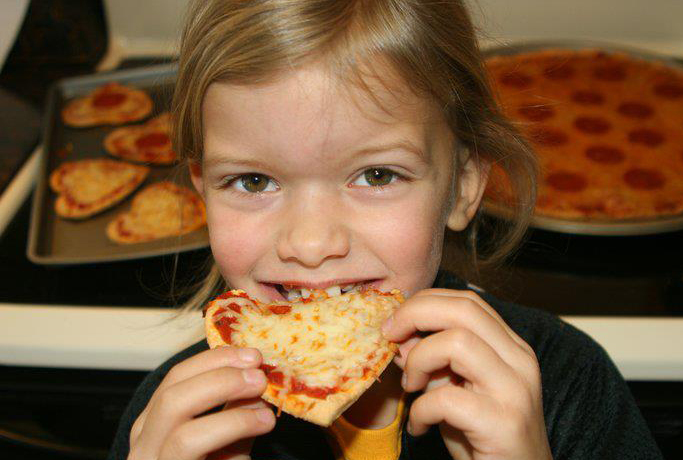 Feel free to post pix of your kids cooking on my Facebook page to help inspire others. 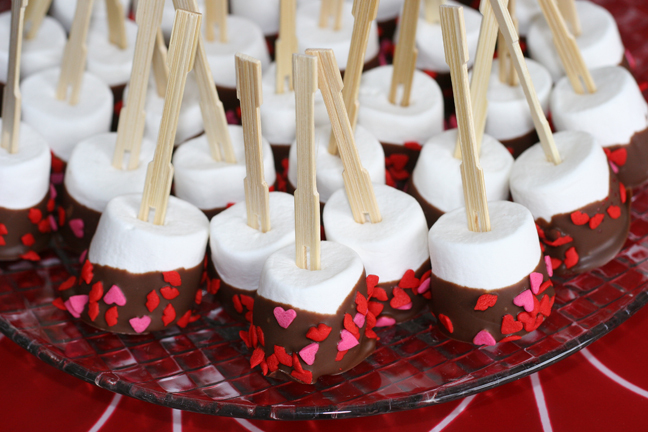 FOR THEM: One of our “go-to” treats — for any occasion — is chocolate dipped marshmallow pops. These couldn’t be easier and I’ve never met a kid who didn’t love them. 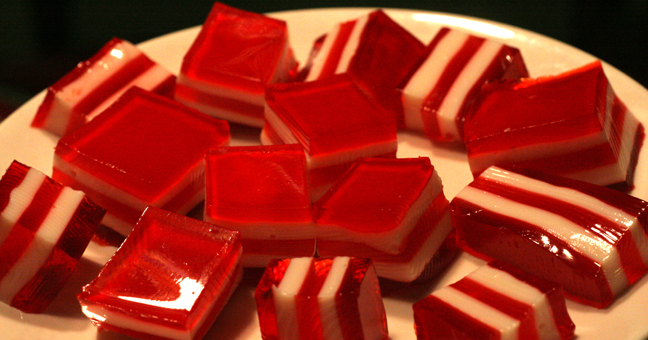 We make and send them in to almost every class party and my girls always say they were a hit. 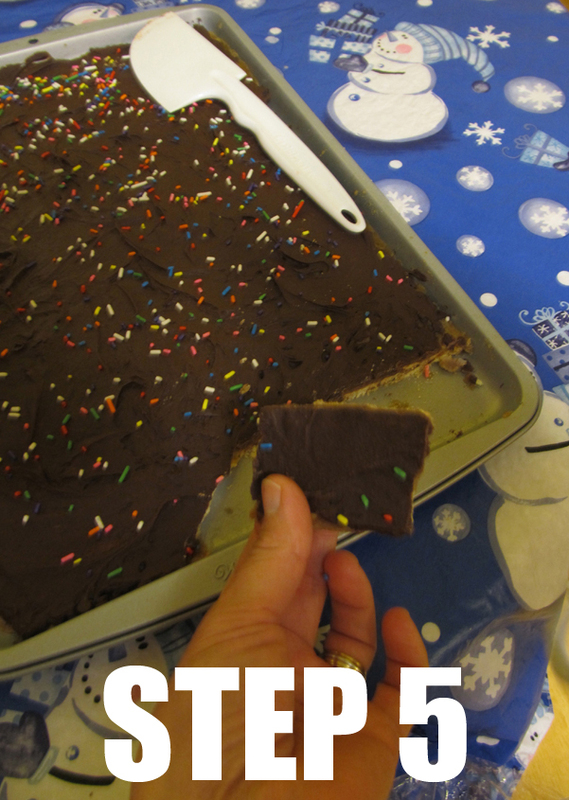 All you have to do is stick a skewer into each marshmallow, dip them in melted chocolate, add sprinkles, put on wax paper and set in the freezer. 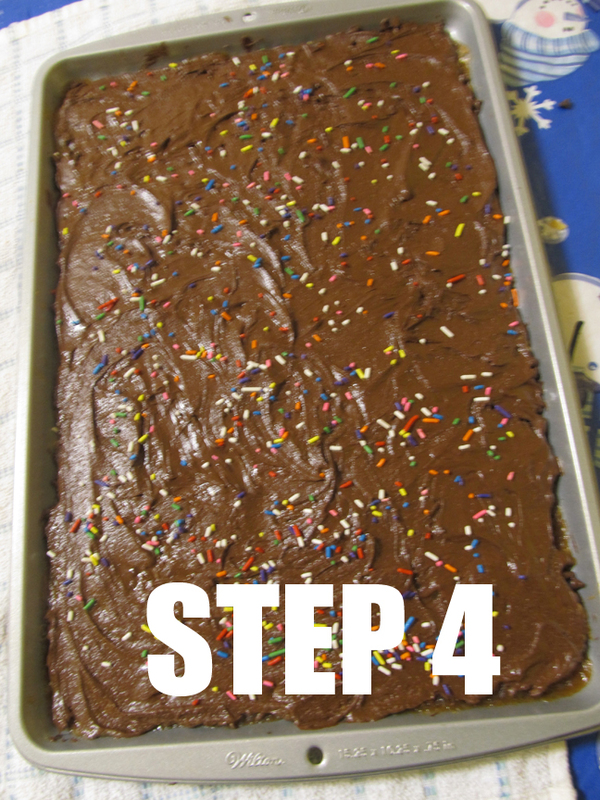 Just change up the sprinkles depending on the holiday and they are a festive addition to any occasion. FOR OTHERS: Make simple peanut clusters. 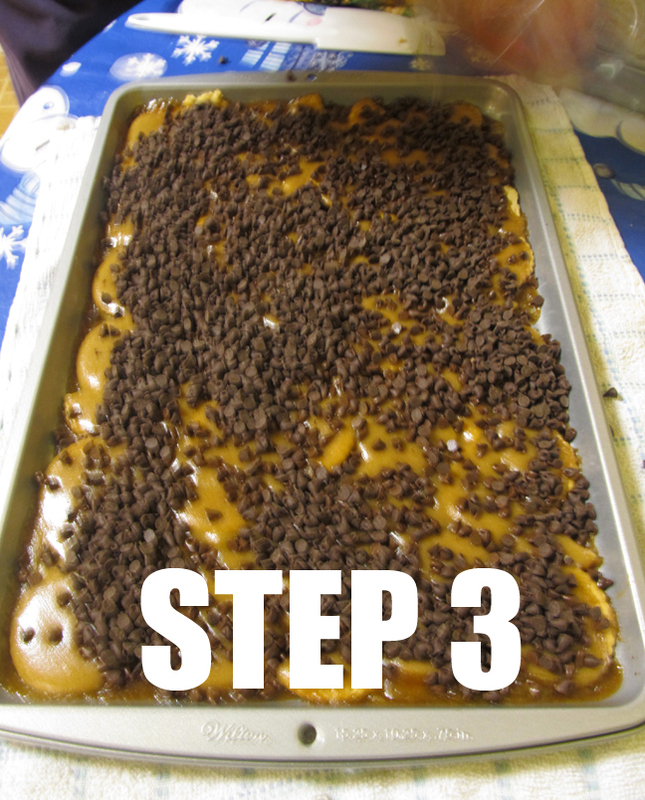 Just fill cookie cutters up partway (depending on how thick you want them) with melted chocolate mixed with peanuts, decorate with sprinkles if you’d like, then let them set in the freezer for a while before you pop them right out. 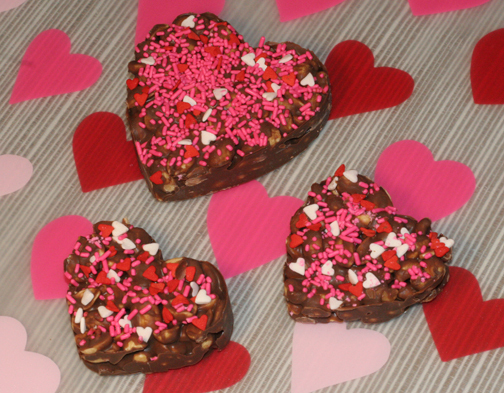 Or let your kids make free-form peanut clusters, too! FOR FUN: Remember and repeat — life is not all about food. When each upcoming holiday nears, I let my daughters become designers extraordinaire… Decorations come up from the basement and I let them decorate this shelf in our living room however they want. This is Lindsey’s most recent creation (she was sick that day and Morgan was somewhere else, so she was even more excited to do this one solo). Putting a bunch of decorations in one spot has a lot more impact than sprinkling them around the house, and my kids are free to revisit and rearrange as they see fit. 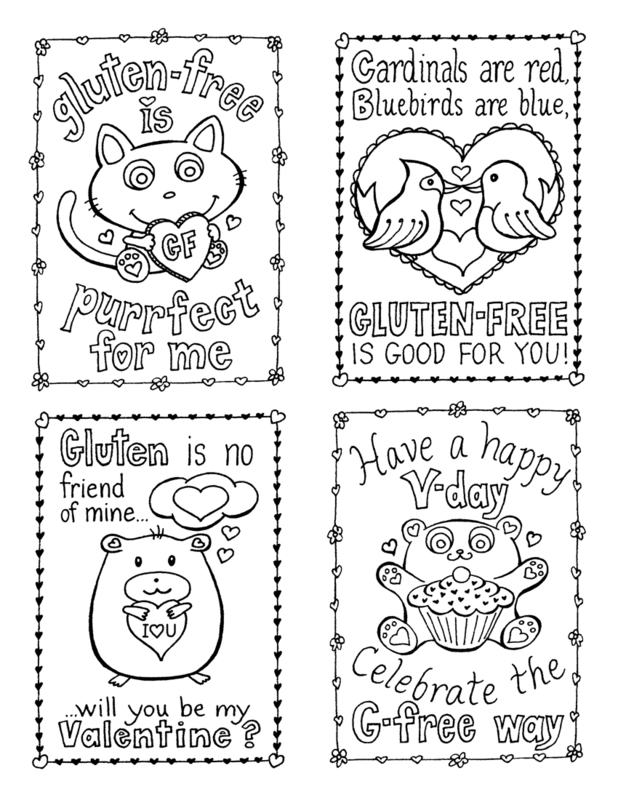 *Also, please stay tuned for 2 special things just for kids: 4 Valentines Day cards for g-free kids to color (as soon as I finish drawing them!) 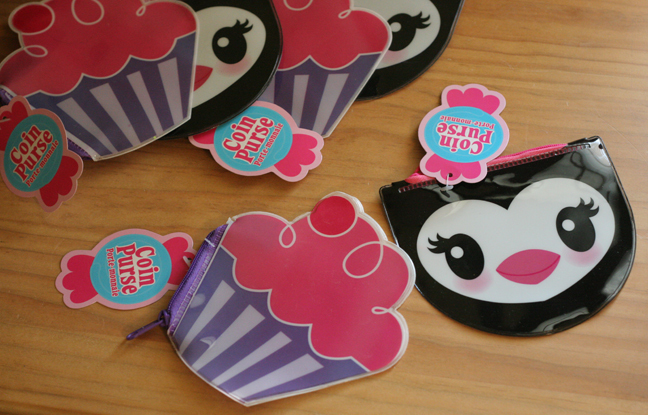 and a mini kids-size giveaway. Should be up in a day or two… thanks! School holiday parties: will your gluten-free kid feel like one of the gang? 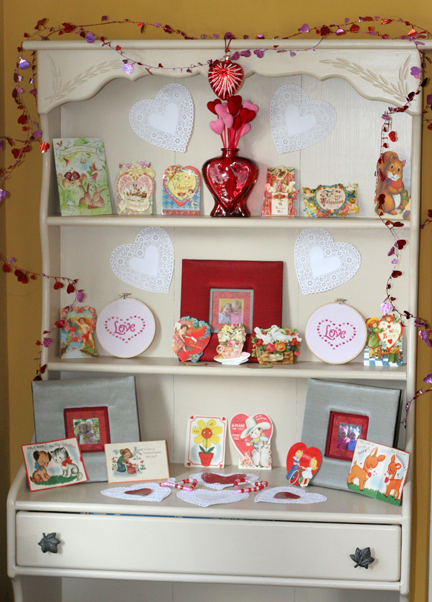 To kids, Valentine’s Day is mostly about the candy. The list of gluten-free candy is as long as that zigzag thing around Charlie Brown’s waist….it just keeps going and going. Sure, there is definitely candy that your child needs [to know] to avoid — like licorice or anything containing cookie pieces or “crisps” — to name the obvious. But with so many great lists of gluten-free candy out there, you really can’t go wrong, as long as you teach your child the differences between them. My favorite, go-to list is from Celiac Family — I love how it’s organized by color and level of safety. It starts with candy (listed in green) that is safe, no question. The middle portion of this list (the type in orange) indicates label warnings about production lines, etc. Personally, I will buy candy in packages that read “manufactured in a facility that produces wheat…” but I will not buy candy that reads “may contain wheat” even if the ingredients appear g-free. But that’s just me. If that’s not strict enough for your family, then stick with the list at the top in green type. As far as the red list at the bottom goes, (if your child is old enough) bring him to the grocery store with you, (or look online) show him what all of those candies look like and explain why he can’t eat them. Then, of course, be sure to remind him that there is plenty of candy he can still enjoy. “Sally”: Some parents will print off a list to notify parents and teachers of the huge assortment of GF candy they can buy to accommodate all students, as well as a list of gluten-free party treat and snack ideas. They might send along a nice note saying how much they and their child would appreciate everyone making sure food is safe for the entire class. If parents really want to get involved with the party planning, they’ll call the teacher or room parents to coordinate what will be served. This might be a good option if you have a very young child who doesn’t yet understand what he can or cannot eat, needs a lot of direction, or has difficulty speaking for himself. This will also help to ease a new-at-gluten-free parent’s fears of the unknown, until they settle into the new routine. “Peppermint Patty”: At the other end of the spectrum are parents who just want to know when the party is so they can send their own food in. These parents choose to just prep their g-free kid to not eat anything he’s not absolutely sure about, and will send him in with any type of treat and a few pieces of candy. This way he has his own stuff to enjoy, regardless of whether or not there is anything served that is safe for him to eat. This will work fine for more independent kids, and those who are very comfortable eating their own food and don’t care that what they have might be different.This also works well for parents who don’t want to feel like they are rocking the boat but still want their kids to be safe. *With any of these options, parents can also volunteer to send in a sweet, g-free treat for the whole class, like fruit skewers or chocolate-dipped marshmallows with sprinkles. Clearly, what works for your family may be a combination of these, or something entirely different. And you may find yourself moving from one extreme to the other as your child’s needs change. There’s no right or wrong. Every family must find their most comfortable way of handling things like this, and sometimes it takes a certain amount of adaptation to see what works best. 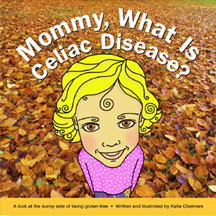 While we can’t expect the world to conform to our kids’ needs, you may find that, in time, as you and your child help spread awareness about gluten-free foods, that you might gain some new supporters. I personally believe that a lot of it depends on your family’s attitude and how demanding you are that other people accommodate your child’s diet. From my experience, politeness and sincerity go a long way to work in your favor, as well as gratitude for even the smallest gesture of thoughtfulness that is shown along the way. As a parent, however you decide to handle school holiday parties, please remember to put on a happy face when discussing it with your child. 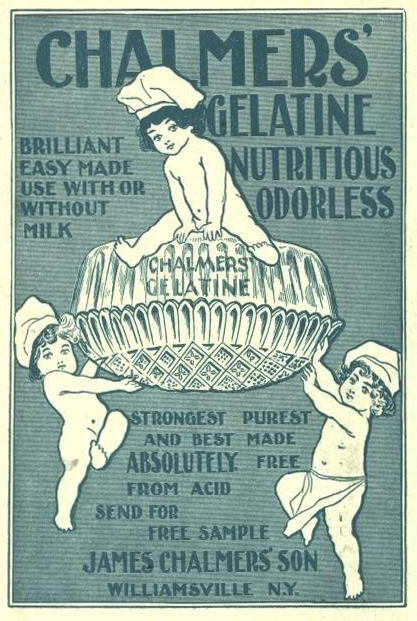 G-free kids of all ages may already be a bit uneasy, especially if they are new at the diet. Show them that you are excited that they get to go to a party, remind them about what’s okay for them to eat, and let them know what they’ll be bringing in for it. Tell them you hope they have fun and that you can’t wait to hear all about it. Remind them that holiday parties are about a lot more than just food — and to just relax and enjoy their friendships, the decorations, music, games, Valentine cards and loot. Kids are much more resilient, adaptable and flexible than some people might think. Do you have any more thoughts on the topic that might help other parents? Feel free to comment below with any additional advice. Thanks!